On this page I'll describe them and their special place in our life. Also our Champion Line Males and Females. 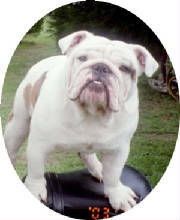 We only use Professional Veternaries that specialize in the care of Bulldogs. We live in Southern Indiana and take great pride in breeding only the best. We strive for the betterment of the breed by selective breeding to breed out genetic defects giving you the best quality Bullies available. Our Top Breeding Male is "STORMI'S WARRIOR" . There are 25 total number of champions in 6 Generation Pedigree. Son of CH. 'BEULAHLAND'S INCRED'BL STORMI aka STORMI. 2002 Westminister Champion. #4 Bulldog 2002 and #1 Stud Dog 2002. Warrior has a great personality and temperment. He has no skin, eye or hip problems. Great companion and loves children. Like all bullies loves to go bye bye. Warrior is small in size weighing 44 lbs.